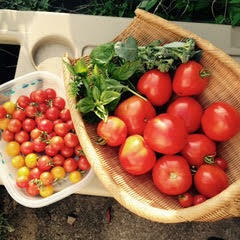 I wait all summer for that day when all of the juicy red tomatoes are ripe at one time – gathering them into a basket, feeling their sunny warmth on my fingers, my mouth watering as I imagine what I will make with them now and in the long winter months ahead. 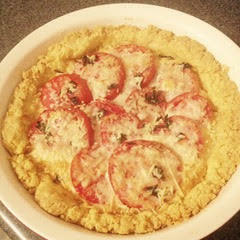 Today was that day – and I had this Tomato Tart recipe printed out and ready. It is so easy to put together (no rolling, no fuss) with common pantry ingredients, and so delicious for lunch or dinner. And leftovers are perfect the next day, too! I make one for myself and one to share with neighbors. Warm sunny smiles all around the table as thanks are given for another bountiful season of veggies straight from the garden to the kitchen and to the table. In a food processor, shred butter on medium shredding blade. Leave butter in the bowl and add flour, corn meal and salt and pulse until well combined. Scrape down the bowl and, with machine running, add water until dough holds together — start with 3 tablespoons and only add additional if necessary to make dough hold together when pressed between your fingers. Press dough into a 9-inch tart pan (or pie plate) covering the bottom and up the sides. Smooth the surface and bake for 10 minutes. Meanwhile, combine mayonnaise, mozzarella, mustard in a small bowl. Spread over the surface of the crust evenly. Add sliced tomatoes in overlapping rows to cover the surface. Sprinkle with the basil and then with the Parmesan. Return tart to the oven and continue to bake for 25-35 minutes until the top is just beginning to brown. Remove to a cooling rack and allow to stand at least 15 minutes before slicing to serve – or serve at room temperature. To make ahead, cool completely, cover tightly and chill. Remove from refrigerator and allow to come to room temperature to serve, or warm slightly in the microwave or a low oven.